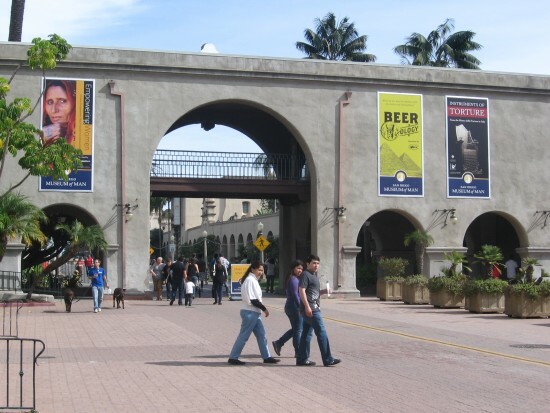 balboa park – Page 49 – Cool San Diego Sights! 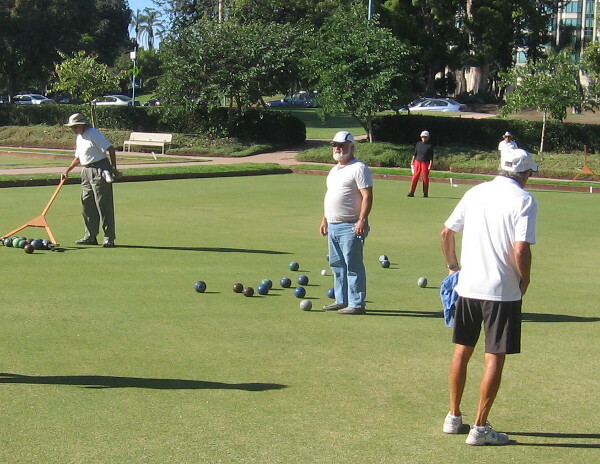 Lawn bowlers enjoy Sunday in Balboa Park. Every weekend, folks dressed in white are out on the bowling green near the west end of Balboa Park. 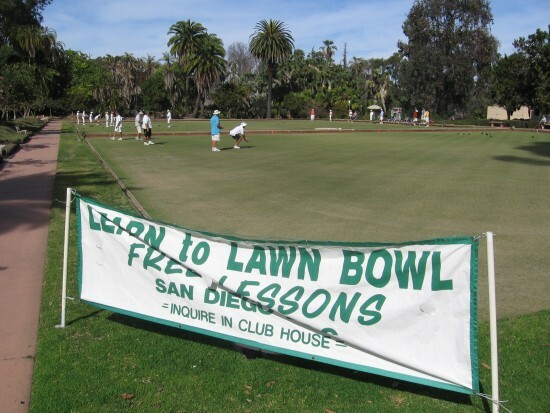 The San Diego Lawn Bowling Club must have a pretty good membership, because I’ve seen scores of players all out enjoying the sport at the same time. I usually linger for a couple minutes to watch a game unfold. Excellent accuracy is required to win. A game has ended and the scattered balls are collected. Keeping score on a lazy, sunny weekend day. Sign provides info about free lawn bowl lessons. 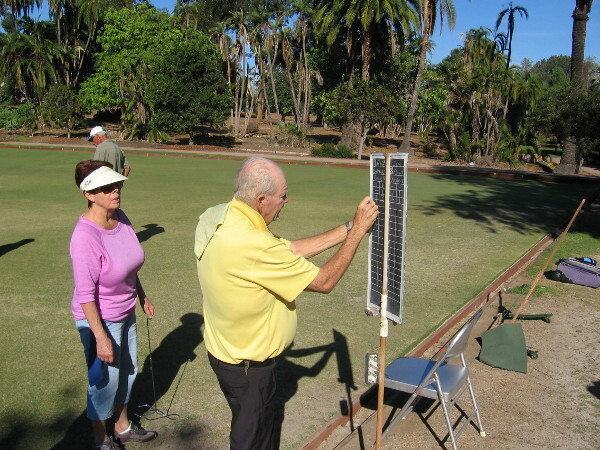 Posted on October 21, 2013 November 22, 2014 Tags balboa park, bowling, entertainment, fun, games, lawn bowling, people, san diego, sports, sundayLeave a comment on Lawn bowlers enjoy Sunday in Balboa Park. House of Turkey fiddler in Balboa Park. Last Sunday in Balboa Park, after checking out the free organ concert, I ventured across the street to the International Cottages. The House of Pacific Relations International Cottages were built for the 1935 California Pacific International Exposition and represent 32 member countries. The little houses, situated in a picturesque cluster, are decorated and furnished in a way that recreates the unique culture of each nation. Every Sunday (except during winter) one of the member nations features food and entertainment in the central grassy area. Last weekend it was the House of Turkey. As I arrived, a Turkish fiddler was on stage fiddling away a merry tune while the audience clapped in rhythm. Here he is! The United Nations Building among the International Cottages. 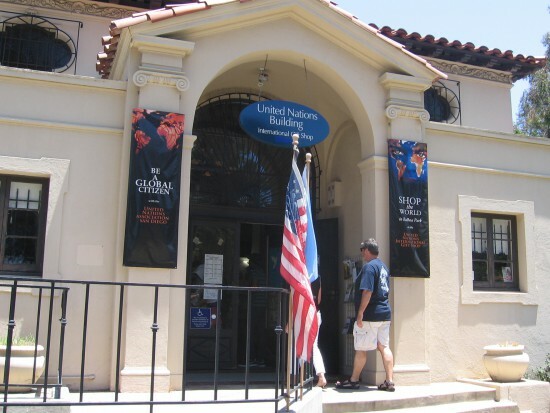 Posted on September 24, 2013 December 27, 2015 Tags balboa park, culture, diversity, events, fiddling, international cottages, music, san diego, sunday, turkeyLeave a comment on House of Turkey fiddler in Balboa Park. Robert Plimpton plays the Spreckels Organ. Robert Plimpton at the Spreckels Organ in Balboa Park. 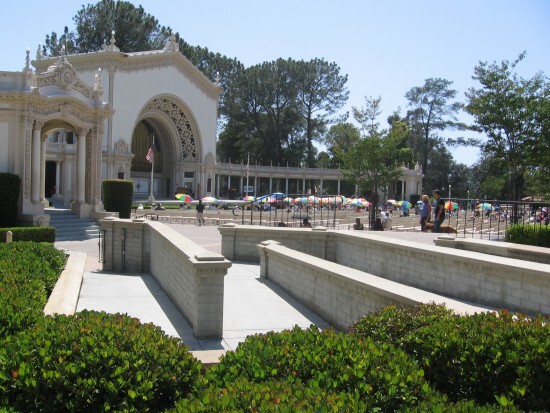 Who’s that person at the microphone in the Spreckels Organ Pavilion? It looks like Robert Plimpton, San Diego’s Civic Organist Emeritus! Most of the time he uses his amazing musical talent as resident Organist of the First United Methodist Church. Robert Plimpton was San Diego’s official Civic Organist from 1984 to 2000, when Dr. Carol Williams (first woman in the United States to be appointed Civic Organist) took his place. She happened to be out of town, so he returned for last Sunday’s free public concert in Balboa Park . . . and played magnificently, of course! I tried to get a good photo of the organ’s enormous pipes, but the images turned out too shadowy. I’ll try again at some future time! A plaque at the historic Spreckels Organ Pavilion. 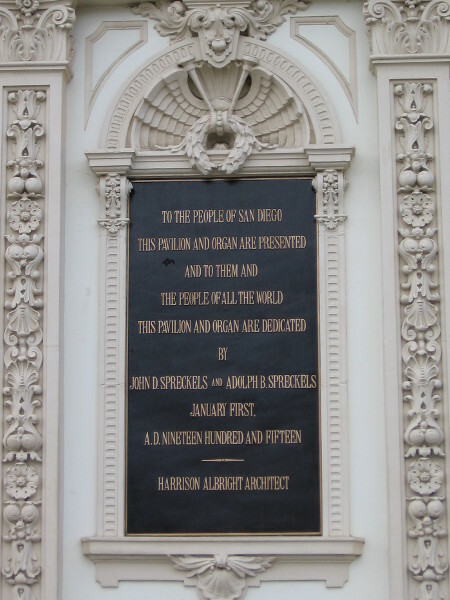 Dedicated to the people of San Diego and all the world, by the philanthropist Spreckels brothers in 1915. View of Spreckels Organ Pavilion from a spot near the Japanese Friendship Garden. 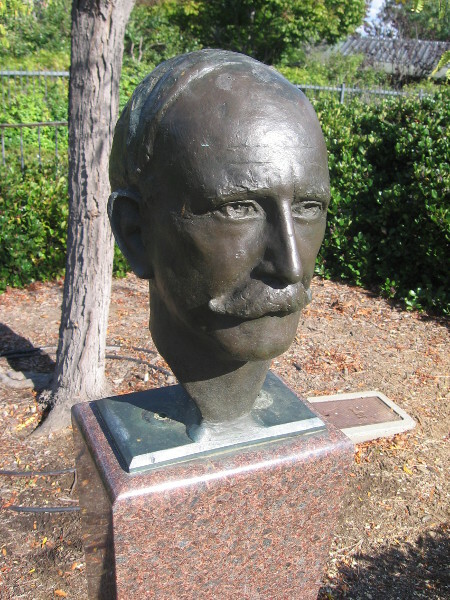 Bust of John D. Spreckels watches organ concerts behind benches. Here’s a photo I took in late 2015, during Balboa Park’s yearlong centennial celebration. 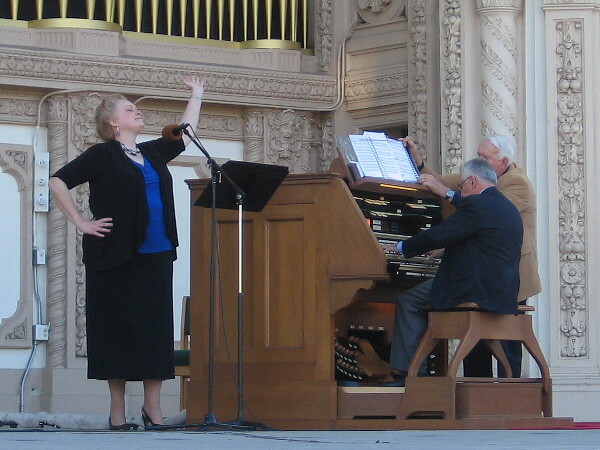 Patricia McAfee, mezzo soprano, and Robert Plimpton, San Diego Civic Organist Emeritus, entertain a Sunday afternoon audience during “A Tribute to Kate Sessions, The Mother of Balboa Park” concert on November 8, 2015. Posted on September 23, 2013 November 9, 2015 Tags balboa park, concerts, culture, entertainment, events, music, organists, organs, san diego, spreckels organLeave a comment on Robert Plimpton plays the Spreckels Organ. Umbrellas add color to Sunday organ concert. It must be around two o’clock on a Sunday afternoon. Time for the weekly free concert at Balboa Park’s Spreckels Organ Pavilion! 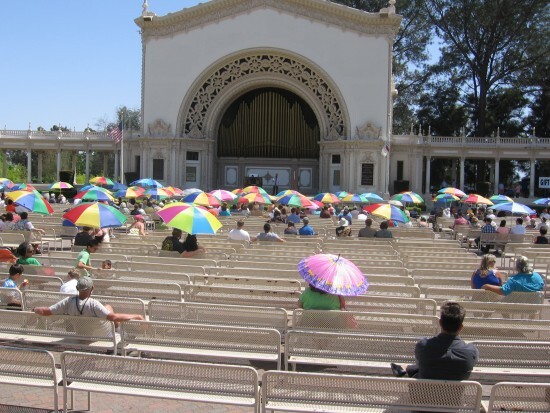 Crowds gather in the sun under colorful umbrellas to listen to the majestic sound of the Spreckels Organ, one of the largest outdoor organs in the world. The city of San Diego employs an official Civic Organist, none other than Dr. Carol Williams, one of the top performing organists in the world! Each Sunday she plays classical music, jazz, marches . . . and occasionally one of her excellent original compositions. 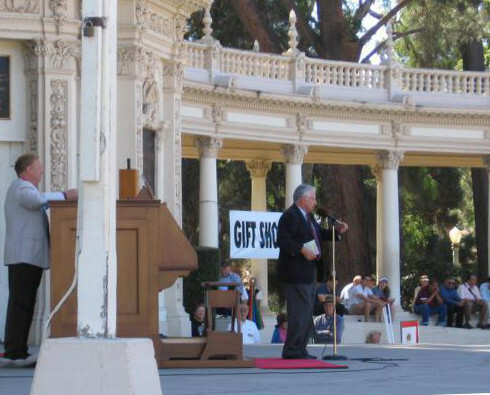 The Spreckels Organ Society helps to raise funds to keep the tradition of free public concerts alive. It’s a tradition that has lasted a hundred years! The beautiful Spreckels Organ Pavilion is used for various concerts and events throughout the year, including the yearly December Nights festival around Christmas. It’s also a favorite venue for wedding photography. The ornate, elegant architecture makes it interesting to visit even when the stage and benches are empty. Organ lovers enjoy shade under the San Diego sun. Posted on September 23, 2013 May 26, 2015 Tags architecture, balboa park, color, concerts, culture, entertainment, music, san diego, spreckels organ, sundayLeave a comment on Umbrellas add color to Sunday organ concert. Military recruits jog through Balboa Park. During my morning walks, I often see military personnel jogging through Balboa Park. Sometimes they can number in the hundreds. They wear distinctive yellow t-shirts marked “NAVY” and lustily chant military cadences as they proceed. I’m not sure whether they are sailors from one of the several nearby naval bases or marines from the Marine Corps Recruit Depot. Usually one or two men will be holding a flag, and a few men in front will lead the way, suddenly changing direction at a moment’s notice. My camera’s flash in this photo reflected brightly off safety tape on the joggers, making the energetic scene appear kinetic and dazzling. Posted on September 17, 2013 Tags balboa park, jogging, marines, mcrd, military, navy, photography, recruits, sailors, san diego1 Comment on Military recruits jog through Balboa Park.